I (Chris) have begun teaching a new 3 week course (9 hours) with about 30 students in the The missions academy, “Panamanian Institute for Transcultural Studies.” The acronym in Spanish is IPET. It’s in the city of Colon, about 45 miles north of where we live, over on the Atlantic coast. Colon is not a safe place. The tourist book reads “If you have no business over there, do not go. If you go, expect to be mugged.” Last night, when I asked to walk down the street (about 6 houses) to get a soda, I was taken by car, not allowed to walk by myself. While I do not fear for my personal safety, the locals know that I’m a prime target and they keep me safe. It’s tropical, humid, and the church I’m teaching in is not using air conditioning. Open windows permit the occasional breeze to come through. The sanctuary lighting is intentionally set low so that the data projector can cast the slides up on the wall. The combination of heat, humidity, and low light after the end of a long work day means that my teaching has to fight fatigue and sleepiness. IPET is the schooling arm of a Latin American sending agency who’s goal is to raise up missionaries from Latin America to other parts of the world. The academy runs in multiple sites in Panama, currently over 10 are running in various areas of the county. Students in this course are paying monthly for 18 months of study, 3 class hours a week plus short term mission outreaches in partnership with local churches. Many are in training specifically to reach other people groups, so it’s more than personal evangelism. I tell you, I believe that God gives tools to the church. Chris is a tool that our church needs to use. I had 9 hours of his teaching and benefited so much from it that my approach to evangelism has been transformed. We need to learn from him. I’m honored by his statement. The classroom has open windows to allow the occasional breeze to stir the air. One can hear the noises in the street, the chirping and callings of night insects. 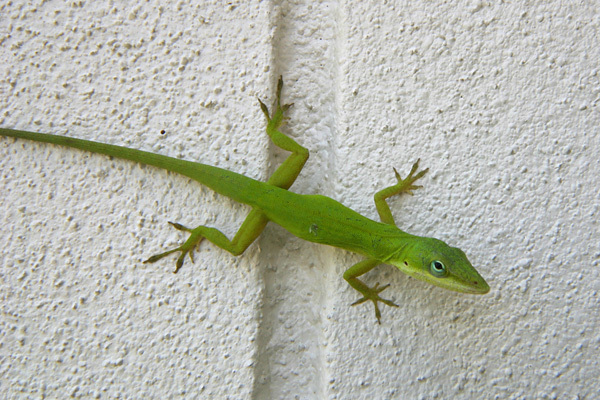 But the open windows allow these little green lizards to get in. They are common in Panama — we’ve seen them in our house on a regular basis. (Imagine grabbing a shampoo bottle only to see a lizard staring at you). Last night was the first night that I saw these lizards visiting the class. I found humor as they chased each other on the walls while I’m teaching on the love of God and how to share it with others. 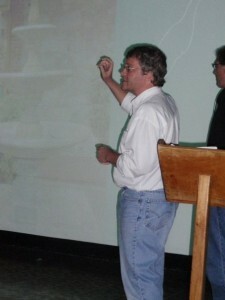 One or two would occasionally run across my teaching images being projected on the cement wall behind me. I find them funny and distracting, but the class doesn’t seem to notice — a worldview issue. It is clear that the doors to teaching here are beginning to open. During the drive home with the director, it was clear that he has more in store for me in IPET and in the missions organization itself. We came with a dream of tapping into a network of trainers, and it is appearing to unfold in a different way that we expected. The level of our teaching events is going to increase considerably over the next few months and that is an answer to prayer. Students in these classes come from a multitude of churches. Already the director is beginning to field phone calls from pastors whose members were in my class. Pastors are beginning to take note and as the Lord permits, we’ll be able to respond. We’ll need your partnership in prayer and support to help us reach these churches and members with a passion to share the good news. Consider joining our monthly support team. You can do so online or by US Mail. 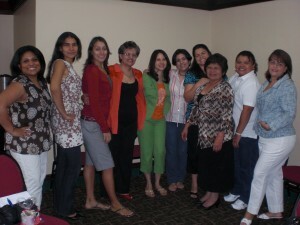 Last month, Brenda worked to help organize a women’s event at the hotel near our house. As part of our ministry’s outreach efforts to build relationships with unchurched people, she and a team planned a morning of fellowship, breakfast, games, and even some door prizes (which is customary at events like this here). 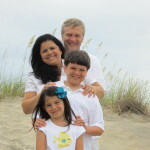 The main goal was to connect with people and introduce them to a new church that is in the pre-launch stage. Several ladies gathered, and Brenda reported that it was a great time of building relationships and hearing an excellent devotional about finding God’s strength in crisis, given by Esther (far right). In April, I’ve been asked to teach 2 three week courses at two different locations for HIMF — Hermandad Iberoamericana de Misiones Fronterizas, beginning this Wednesday April 1. I am teaching in a missions academy called “Panamanian Institute for Transcultural Studies” It is the schooling arm of HIMF, who’s goal is to raise up missionaries from Latin America to other parts of the world. The academy runs in multiple sites in Panama with more in the planning stages. The goal is preparing for long term missions work abroad among unreached peoples. My first class has students all from panama. A majority are sensing a call to Muslim areas of Afghanistan, eastern Europe and north Africa. Some are still exploring their call, others are preparing for work with immigrants here. Classes are in Spanish, so I’m teaching my evangelism material in Spanish.